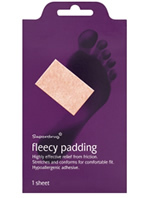 Chiropody felt is available in different thicknesses and different materials. The one I use all the time is 100% semi compressed pure wool. It is cut to size and then applied to the skin. When applied properly it is excellent at helping to stop pressure on the skin. I buy this felt in packs of 4 very large sheets however it is available in smaller sized packs. I find the most useful thicknesses are 2mm and 5mm. Alternatively you can purchase the ready cut oval corn rings. Fleecy web and moleskin are generally much thinner than chiropody felt.